Too tired to cook when you get home? Do you feel guilty if you don’t provide a good dinner for yourself or your family? Are you worried that your meals aren’t healthy enough? Do you get stuck deciding what to make? Are you frustrated with having the same meals over and over? √ How to make it easy to decide what to have for dinner with 120 delicious, healthy, FAST 5-ingredient recipes. √ The easiest way to make your meals healthier with real food. 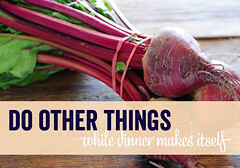 √ The secret to finding time and energy to cook after work with 19 healthy 5-minute suppers. √ 7 tips for ingredient substitution to help overcome the missing ingredients problem and boost your confidence to try new ideas. √ Each recipe contains 4+ variations – over 480 ideas. √ Bonus 1. 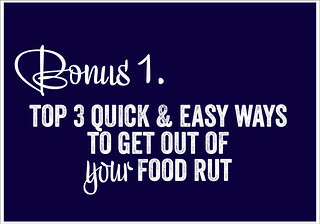 Top 3 quick and easy ways to avoid your food rut. √ Bonus 2. A printable pantry checklist – to give you peace of mind and ensure you have ingredients when you need them. Prefer to pay in Australian dollars? Click HERE. Patti, Tired & Hungry Cook’s Companion Reader. Chapter 1. 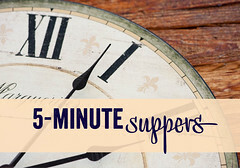 5-Minute Suppers 19 favourite 5-minute suppers for when you don’t have the time or energy to cook. Includes recipes such as rice & greens, warm butter bean salad, spiced couscous with broccoli, warm salmon salad + more. Chapter 2. 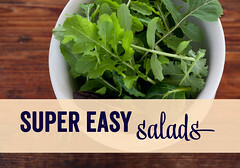 Super Easy Salads The quickest way to get healthy meals on the table with 11 super easy salads. Includes recipes such as warm chicken salad, big vegan salad, warm mushroom & goats cheese salad, chickpea & yoghurt salad + more. Chapter 3. 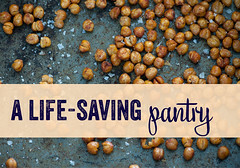 A Life Saving Pantry 13 life-saving pantry recipes to give you peace of mind that you’ll always be able to whip up healthy dinners at a moments notice. Includes as broccoli pantry curry, salmon & butter bean salad, spaghetti with chilli & garlic, quinoa & grilled veg salad, chickpea & vegetable salad + more. Chapter 4. 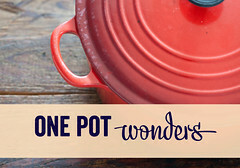 One Pot Wonders How to keep washing up to a minimum with 10 one pot recipes. Because tired cooks don’t want to spend hours doing dishes. Including simple chicken laksa, pesto cauliflower, hot beef curry + more. Chapter 5. 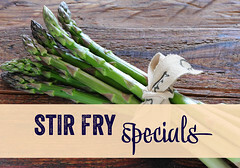 Stir Fry Specials How to master the art of stir frying – one of the quickest and healthiest cooking methods. Includes 9 special stir fry recipes including chicken stir fry with seasonal veg, beef & broccoli stir fry + more. Chapter 6. 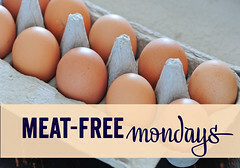 Meat Free Monday How to eat healthier with more veggies in our 15 healthy meat-free monday recipes. Includes 15-minute falafels, zucchini burgers with yoghurt sauce, veggie burritos and more! Chapter 7. 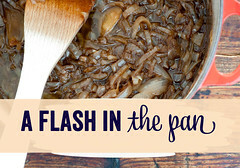 A Flash in the Pan This chapter is a celebration of the skillet or fry pan – the work horse of the kitchen equipment. Includes 11 recipes such as chilli chicken with hummus, lemon steaks with broccoli, eggplant parimigiana, vietnamese chicken balls, salt crusted burgers + more. Chapter 8. 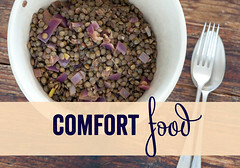 Comfort Food Warm your mind and nurture your soul as well as feeding your body with the 10 comfort food recipes. Including quick veggie soup, pasta with prosciutto, chile verde + more. Chapter 9. Do Other Things [while dinner makes itself] This is the only chapter including recipes which will take longer than 15 minutes to get on the table. Free up your time while dinner practically makes itself with the 11 do other things recipes. Includes classics such as roast eggplant with tomato sauce & pesto, the baked frittata, lamb shanks with apricot, chilli con carne + more. Chapter 10. 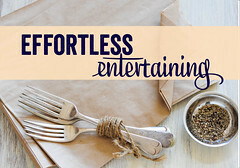 Effortless Entertaining Discover the truth about mid week entertaining. With 5 different meals that will help you get together with friends mid week for a fun and relaxing evening – without you having to spend hours in the kitchen. Includes themes such as ‘friday night pizza’, sushi party, a simple italian supper + more. Chapter 11. 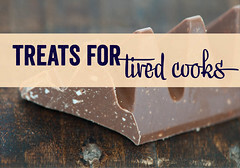 Treats for Tired Cooks Treat yourself or show you care with 6 quick and easy sweet treat recipes. Includes blueberries with ricotta, healthy banana ‘ice cream’, decadent dark chocolate mousse and more. √ Browse the interactive index to find recipes based on the seasons, different cuisines or your mood. √ Always have the recipes with you. Save it at work, home, on your ipad and on your phone! √ Never get bored! Each recipe contains 4 or more suggestions for variations – giving you over 480 ideas in the one eCookbook. √ PLUS! Save time – all recipes (except the ‘Do other things’ chapter) are designed to be made in 15 Minutes OR LESS! √ The top 3 quick and easy ways to avoid getting stuck in a food rut. √ 7 tips for ingredient substitution to help you overcome missing ingredients. 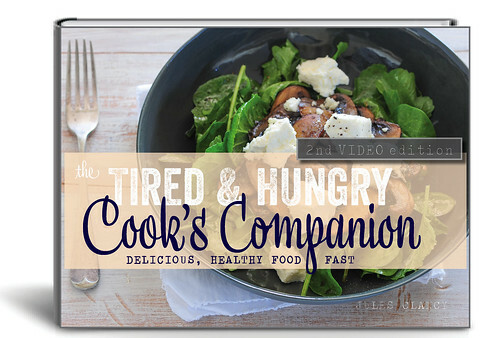 √ My 3 favourite ‘template’ recipes to give you the confidence to cook with what you have. √ The number 1 way to jazz up a tried meal with 10 recipes for delicious 5-Minute sauces. √ A printable ingredient substitute ‘cheat sheet’ to help increase variety. 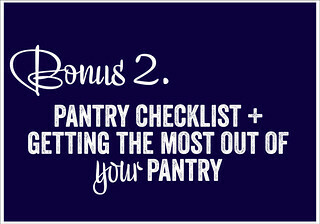 √ A printable pantry checklist so you’ll feel organized and in control. √ Plus! 13 easy ways to get the most out of your pantry (bonus audio track). For peace of mind and confidence to make dinner without shopping on the way home. Jen, Tired & Hungry Cook’s Companion Reader. Emma, Tired & Hungry Cook’s Companion Reader. Aldrea, Tired & Hungry Cook’s Companion Reader. Wendy, Tired & Hungry Cook’s Companion Reader. Audrey, Tired & Hungry Cook’s Companion Reader. Nicky, Tired & Hungry Cook’s Companion Reader. See more reviews over here. Why should I buy another one? Do any of your cookbooks contain recipes with only 5 ingredients? Are they designed for quick and easy cooking or are they more about looking good? Do they have a section devoted to 5-minute recipes? Can you make most of the remaining recipes in 15 minutes or less? Do they come with a list of variations for every recipe? Are any of them ebooks saved on your smartphone or tablet? Can you access them when you’re deciding what to cook – whether that’s at the office or in the supermarket? The last thing I want is for The Tired & Hungry Cook’s Companion to be another cookbook you buy and then never look at again. So I’m happy to give you 60 days to test drive it. If you find that you haven’t used it to cook anything, all you have to do is email me [jules@thestonesoup.com] and I’ll refund 100% of your money straight away. You have nothing to lose apart from a few minutes. Do You Love Print Books? Not Sure You’ll Use a Digital Product? 1. Always have these recipes at your fingertips. Save in multiple locations – work computer, home computer, smart phone and iPad. See the answers to common questions over here.